Started in 2010, our Shakespeare Camp shines a spotlight on budding young talent, both on stage and behind the scenes. Students dive headfirst into acting, improvisation, technical support, and stage management. Our instructors provide structured experiences that focus on building creativity, teamwork, self-reliance, mutual respect, self-esteem, and fun! Shakespeare Camp includes instruction in acting, unarmed stage combat, and in-depth study in scene work in one of Shakespeare’s plays. Students who prefer a supporting role receive training in various areas behind the scenes, including the design and creation of costumes, props, set pieces, and more. 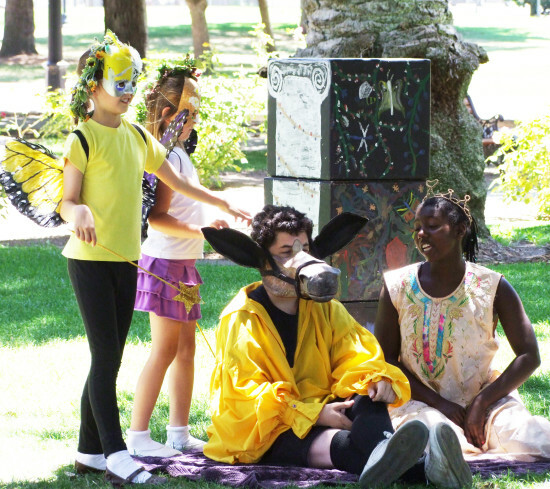 Camp culminates with a performance of an abridged version of one of Shakespeare’s plays. Campers of all experience levels are welcome. 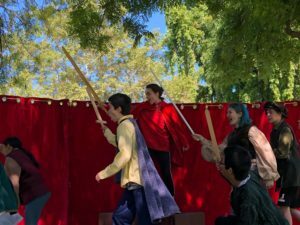 We hope your child can make a scene with Silicon Valley Shakespeare this summer! Students must be between 8 and 18 years of age. Partial scholarships are available to students with an annual household income of 80% or less of the Median Household Income for Santa Clara County and who demonstrate a desire to participate by submitting a short essay on why they want to attend the camp. For more information, email Education Director Melissa Jones. * Donors Circle discount available for Baron level and higher. Ms. Freeman received her B.A. and teaching credential in English with a minor in Theatre Performance from SJSU. 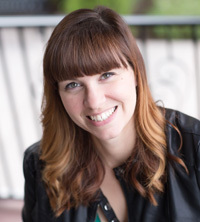 For the past ten years, she has taught English, film and drama at Branham High School in south San Jose. While Ms. Freeman was the Performing Arts Chair, Branham High School received the City of San Jose Champion of Arts Education Award (2009). She also enjoys acting during her summers away from teaching, and you may have seen her on the SVS stage many times.